Hey everyone! I'm super stoked to tell you all about TEMPTING FATE, the next installment in my Fate of the Gods series, coming August 13, 2013! It's an e-novella which takes place DURING Forged by Fate, and you can check out an excerpt over at World Weaver Press! I'm sure you all remember Mia -- you know, the younger sister who drives Eve crazy in Forged by Fate? Well, I couldn't resist giving you a taste of things from her point of view. When you start reading, you'll understand exactly why. I'm celebrating the announcement with trading cards! 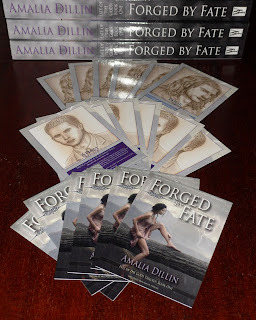 So head over to Goodreads and mark TEMPTING FATE "to-read" and then leave a comment on this post, and I'll pick a winner or two -- be sure to check back here on the blog on Thursday 5/23 to see who, and claim your prize! I'll send along some stickers, too, probably, because that is just how I roll. If you have a paperback copy of Forged by Fate, I'll even send an autographed bookplate. You've got until Monday, 5/20 at 11pm Eastern to enter. :) This is just a side story which takes place during Forged by Fate so you already know what happens to Thor! Don't worry! Sounds pretty amazing - and those trading cards looks so wonderful. Especially those Thor -ones, oh my I love Thor so much! Of course it's on my "To Read" shelf! I can't wait!!! Trading cards not involved in a game or only so so, but I guess cards are still cool no matter what. Although if I win these cards it will just make the wait for the next book worse. Ahaha. I am totally the opposite with my trading cards. I hate the ones that are for games, and LOVE the ones that are just for collecting, with art or screenshots, or whatever. Ha! all right :) You still owe me a picture from the t-shirt! :P Thanks for adding! !